Nate’s Delicatessen was a local landmark on Maxwell Street, and by the 1990s it was the only restaurant where you could sit inside at a table. Nate prepared kosher corned beef and pickled herring from recipes of the deli’s former Jewish owners, from whom he bought the business as their former employee. 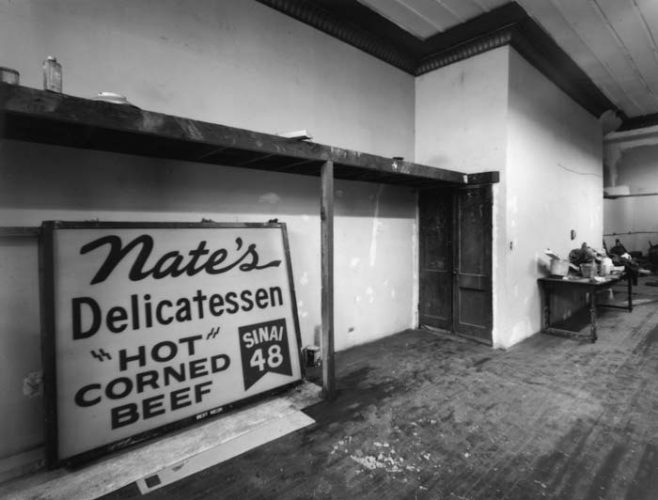 Members of the Maxwell Street Foundation salvaged Nate’s Delicatessen marquee when the building was demolished in 1995, and temporarily stored it in a nearby building with permission. All images published by the Maxwell Street Foundation within this website are copyright of the artist and are for educational, personal, and/or noncommercial use only. For any other use, please contact gro.n1555619475oitad1555619475nuoft1555619475eerts1555619475llewx1555619475am@of1555619475ni1555619475.